Are You Enjoying The Resurrection Life? The resurrection life. Do you know what it is? Can you live the resurrection life now? In this message, Evan teaches the simplicity of this life God intended for us, and how our lack of knowledge of what Christ has done for us, is the greatest destroyer. Watch this video, and gain understanding, and begin reigning in life today! Posted on February 18, 2013 September 16, 2016 Author EvanCategories Grace Audio/Video MessagesLeave a comment on Are You Enjoying The Resurrection Life? Your True Identity Will Cause You To Soar! You cannot do anything to be more holy or righteous than you are in Christ. You can grow in your understanding of your holiness and righteousness. Your lack of knowledge can cause you to live a defeated; self condemned life, (Hosea 4:6 My people are destroyed for a lack of knowledge); however, that won’t make you any less holy or righteous. In Him you are complete, and as a believer, you are forever in Him. Learn and remind yourself of who you are, your new identity, because if you don’t, you will live a self condemned defeated life. Something God never intended for you. I remember a song we use to sing, “holiness, holiness; that’s all I long for, holiness, is all I need…” What we have longed for, we have! What an amazing and extreme loving Father! Jesus paid for and finished our redemption and victory, so don’t keep putting it off until the “sweet by and by,” learn and receive your new identity in Him. Receive His abundance of grace and gift of righteousness, and reign in life today! The eaglet that was raised with the chickens lived a defeated life, he always felt there was more to his life; he dreamt that he could fly; he even used to sing “flying, flying, is all I long for, flying is all I need…” He still fell short of his God-given potential, because he lacked knowledge of his true identity. Once he saw another eagle soaring high in the sky, he had a revelation of his true identity, and that very moment, he achieved his potential, simply by discovering who he really was. Who he was, was always the same, what changed him was his revelation of the truth about himself! And you shall know the truth (about yourself), and that truth will set you free. I read a grace teaching blog the other day, where the author was concerned that believers who were learning grace might go overboard regarding grace, oh my maybe even become extreme, (I realized at this point it was too late for me, because I have already become radically extreme), and he thought these believers might “stop resisting sin; they might quit giving, and maybe not go to church,” the list went on and on and on. People are still worried that grace is not powerful enough to do it all, so they want to mix just a pinch of law (leaven) to bring about a little restraint, so that we don’t get too extreme. A little leaven, even a pinch, will leaven the whole lump! Grace teaches us! Grace is so much more amazing and powerful than many Christians think. Once we wake up to our new identity, and we are wonderfully shocked and amazed at how much God loves us, and how good He is, we will never be the same. We will become extremely, extreme, and fly out of the chicken coup, to soar in the heavens, and it does feel oh so good! You are holy. You are righteous, reign in life today! Posted on February 16, 2013 Author EvanCategories Abundance of GraceLeave a comment on Your True Identity Will Cause You To Soar! To Fully understand God’s grace, you must understand God’s love, and your worth to Him. Without this understanding, fear and self condemnation will keep a person striving to please God through their self efforts, under the law, or worse, a mixture of law and grace. In this message you will learn more about God’s love for you, and your worth to Him, and why His grace is so simple. In today’s blog, I am publishing an article written by a good friend of mine, Bill Ruhl. Grab a cup of coffee, and enjoy! 1) Keep on eating because everybody I know eats it and they’re just fine. 2) Even though it’s my favorite food, I’m just not going to take any chances so I won’t eat it again. 3) This is important to me so I’m not going to swallow whatever I think or hear. I’m going to find out for myself. In the age we live in there are tremendous resources to find conclusions to much of, what we declare to be, ‘Mysteries’, especially the things that can harm us. Anything that can shorten your life or dramatically lessen its qualities, should be a target for definite research. Now that some groundwork for thought has been laid, the shoe drops. What about our spiritual life? How much of that have we taken for granted? How much of what we’ve learned from those around us about biblical knowledge have we just ‘assumed’ as correct? Religious pills have been distributed for years by institutions we regard as infallible. There are even key points in our history books that have been omitted or ‘re-written’ so that the view of those learning will see it according to the ‘re-writer’. Just a simple visit to the Library of Congress website will show you volumes of books that have been rewritten and edited and republished over the course of centuries. To really verify something that an original author intended, requires reading the original print. Here we go, another shoe drops. Many, including myself, have found it very confusing over the years because of the many translations of our beloved Scripture. There are even verses in the Bible that worn us of adding or subtracting from Truth. One night, my wife asked me a question. “Who put the Bible together?” My initial response, at least in my heart, was “God of course!”. On a rare occasion I actually think before I talk, this being one of them. It occurred to me that they were just human beings, flesh and blood just like us. I’m sure they had a healthy knowledge and a great deal of understanding of the original scriptures but again, they’re made of the same stuff that all of us are made of. “I’m not sure who they were!” I found myself a little bit taken back by my own response. I’ve always accepted the Bible as being the inspired, holy and perfect Word of God. I’ve been preached to for years on that precedent. When someone opened the book and began to recite its contents, I always took notice. At times it offended me and I didn’t want to hear it and at times it fulfilled me and I couldn’t get enough. The word ‘Canon’ or ‘canonized’ when used in association with the birth of the Bible, has always been a ‘Holy’ word to many. I went to Wikipedia on the Internet and looked up ‘biblical canon’. Here’s what it said…….A biblical canon, or canon of scripture, is a list of books considered to be authoritative scripture by a particular religious community. The word “canon” comes from the Greek “κανών”, meaning “rule” or “measuring stick“. Now I don’t know what you think, but I had been under the assumption for years that there was some sort of mystical meeting of great godly, learned men that decided by some amazing revelation from heaven to bind the letters and historical documents into what we now know as the Bible. The origin of what we now know to be our Holy Bible, is really quite different than I had supposed. Am I saying that the Bible is not inspired of God? Absolutely not. It’s really amazing to me how over the course of centuries, the Bible has maintained the integrity that we see today. When I say integrity, I’m not talking about purpose or validity. I’m simply making reference to its overall appearance and thought. What we have today in written form has survived the dark ages, hand transcribed countless times and over the years not much in it has changed outside of some punctuation. There are some differences that we should note though from the original translations. Most translations indicate verses that were not in the original Greek or Hebrew text. I’ve seen them for years in italics and really didn’t pay too much attention to them. After all they are in the Bible right? Unfortunately the inclusion and changing of some Scripture is as volatile as changing one electron in an atomic structure. The results can be deadly. Let me give you an illustration, hypothetically of course. A man was marooned on a desert island. With no way off the island he was desperate to get a message to his wife back home. Being a seafaring man, he understood the currents and knew that if he floated a bottle with a message in it, it would eventually be found by someone on the mainland. Possessing only one sheet of paper and a writing instrument with very little ink, he penned the following message. He knew that the love he and his wife shared with define the ‘in between the lines’ content. At that point, the ink ran out and he carefully rolled the letter into a scroll shape, sealed it in the bottle and placed it in the outgoing tide. I know your initial response is probably something like this; “What the heck! They did not interpret that correctly at all!” 100% correct. I mean YOU are 100% correct if you came to that conclusion. You see, those that found the message could not correctly interpret the message without understanding the love of the author for the recipient. They intentionally put their ‘slant’ to it so that it would be more effective. Well at least to them. God’s message to us has always been and will always be about love. His love. Not our interpretation of how he loves us, but his heart and desire for us. You might think that this is an over dramatized illustration. You might assume that, sure there are probably some differences, but nothing that will amount to what you just read. Let me assure you, just as Jesus said ‘a little leaven leavens the whole lump’, it doesn’t take much to make God’s love look way different than it really is. There are many scriptures that over the years I interpreted a certain way. The majority of them I understood because of someone else’s belief. Because there were many around me that thought the same way, I just assumed that I understood what I was reading. Many times though I had an unsettling feeling that something was just not right. I wanted so much for the gospel to be good news. For it to bring me life and joy. I found myself manufacturing joy and love in my own heart and trying to convey it to God and others. I would literally run out of gas and feel condemned because I just didn’t measure up. It was not a response to a loving God. It became a sacrifice to appease a God that could be mad at me because I didn’t measure up. Now when you have this type of a filter in your mind, everything that you read and learn concerning God and Jesus and the Holy Spirit is soiled. How can this be? How can God love me so much that he sent his son, his only son, to die for my sin, and I struggle to love him back? Remember the leaven? Or to put it in our terms, a little bit of yeast causes the whole dough to rise. In other words, just a simple misunderstanding can change your entire perspective. Or, as it should be said, just a simple understanding can change your entire life! There are key scriptures that have completely reformed my thinking because I have learned through the filter of Grace, God’s Love for me. This new thinking causes me to see God and his love for me as it really is. It excites me to know that the gospel is just that good! I can respond with joy to God now instead of bringing sacrifices. I can rest. Following is a Scripture with a word in it that has crippled the hearts of millions concerning God’s love. A primary preposition (often used adverbially); properly denoting accompaniment; “amid” (local or causal); modified variously according to the case (genitive case association, or accusative case succession) with which it is joined; occupying an intermediate position between G575 or G1537 and G1519 or G4314; less intimate than G1722, and less close than G4862): – after (-ward),X that he again, against, among, X and, + follow, hence, hereafter, in, of, (up-) on, + our, X and setting, since, (un-) to, + together, when, with (+ -out). Often used in composition, in substantially the same relations of participation or proximity, and transfer or sequence. From G3563; to exercise the mind (observe), that is, (figuratively) to comprehend, heed: – consider, perceive, think, understand. The original Greek word is metanoia. Now for those of us who are not language scholars, I will give you my version of what I have learned about translation. Culture is the driving force behind word definition and the Greek culture was very sophisticated in their description and definitions. Unfortunately the American English Language is the least. For instance, we have one word for ‘love’. Without applying an adjective, we use that word for every application of the word love. Definition is implied; I love hamburgers, I love my children, I have fallen in love, etc. The Greek has a descriptive word for each ‘type’ of love giving depth to understand it’s implication. With that in mind, we need to look deeper into the key word to see its fullness. Many times it will change the context, thought and intention of the message being conveyed. In Romans 2:4 it is a dramatic difference over the traditionally taught context so let’s look at that first. The word repent has been known only as a corrective term to the Christian and non-Christian communities alike. Expressions like ‘get right with God’, ‘make peace with God’, ‘get right or get left’, ‘straighten up and fly right’ and many more have all been associated with repentance, all in a negative connotation so as to perpetrate a positive response. When someone tells you that you must repent, then more than likely they think you are wrong and they are right. That always produces argument because the intent is accusation. This is why many ‘bristle up’ when repentance is used in conversation. Depth of meaning is the solution to communication and the Greek language was very suited for the task. In addition to translation deficiencies, re-translators added their thoughts with the translation to produce a resulting context that complied with their own belief system of the day. As before mentioned, note many phrases in scripture in italics; ‘not in original translation’. Moving along here. The Strong’s definition of metanoia breaks down the word into two roots; meta meaning ‘accompaniment’ or ‘along with’ and noiea which we get the word ‘know’ from. It carries the definition ‘understanding, perceiving and comprehending’. Put them together and the word translates to this intent; think differently. Now, in context to the verse and chapter, it means ‘come along with me and know what I know. Reference to God is direct and not just implied so the word is saying this; “If you think like me about yourself, then your understanding of me will change”. I know what you are thinking right now, “How did you get that from that?” Now let’s look at the verse a little further and broaden the context even more. It is essential to understand how to repent or better said, how to metanoia. The traditional understanding of this is “God is good and I need to change because He is good to me. He gave me a savior so I need to show Him that I am thankful and change”. Nothing could be farther from the truth! Allow me to tell another story to illustrate how goodness changes our mind. An older gentleman moved into a family neighborhood. There was a lot of talk about who he was, even some ‘creative’ fabrication. A casual conversation with him left an individual with an ‘ok’ feeling, but didn’t really answer the circulating questions of ‘just who is this man?’ Some believed he was a good person but didn’t bother to meet him. Some made conclusions by the way he dressed and the vehicle he drove. Still others felt fearful of someone different and they supposed things, fabricated things and circulated their discontent with surrounding ears. All in all, opinions were formed and there existed a mind set in the community about the gentlemen that caused some confusion. One day an invitation was sent out to everyone in the neighborhood to attend a dinner at the man’s home. It was very large and considered one of the elite estates in the community. The day arrived and many came, mostly out of curiosity, to attend. There was a large dining hall with an amazing table set with the finest china and silver. The aromas that filled the air were delectable and desirable and his staff greeted and seated everyone as though they were royalty. The first of seven courses were served and the food was absolutely off the chart in taste, quality and presentation. One by one the courses were served, each one surpassing the previous. Then, gifts were brought to each guest that matched their hearts desire and there was a sense of awe and shock in the hall as this amazing event continued. At the end of the table sat the gentlemen who had remained quiet and smiling to this point in time. Rising from his seat, a hush fell over the people as silverware and glasses came to rest. Everyone there was intent on hearing what this was all about. Why the dinner and gifts? Clearing his throat, the gentlemen began to speak ‘I have learned about all of you from a great distance, your hopes and dreams, likes and dislikes, and many details of your lives. How I have done this is not as important as why. I simply love each and every one of you. I moved here to be close to you so that we could enjoy time together. The dinner and gifts are just a token of my love for all of you and I expect nothing in return for them. My staff will send you home with a complete portfolio and biography of who I am; assets, wealth and any other question you might have. I just want us to know each other.’ Astonishment fell on everyone there and minds began to change………..
What changed their minds? The gentlemen’s goodness. Do you see a picture here that wasn’t there before? God never intended us to change our mind, let alone ourselves! His goodness brings us to metanoia not our will or effort. In this story, the good things that the man did for his neighbors literally erased the mind set in his guests and caused them to think like he thought. This is what Romans 2:4 is telling us. When we begin to see God’s love for us through the filter of extravagant Grace and not condemnation, His Word to us opens up with Life and Joy and gives us newness and purpose! God has wonderful things planned for those that will just ‘attend’ , even out of curiosity! The Gospel is so good that it is news that is hard to believe! There is nothing we need to do except for just that, believe! This was just one example of how Gods Love is confused and diluted with incorrect interpretation from those who don’t understand Him. Seeing Him as a Father not a master, enjoying Him as an Heir to all that is His not a servant and honoring Him as my Maker not just a creator causes me to live an Abundant Life free from fear and lack! Posted on February 9, 2013 Author EvanCategories Abundance of GraceLeave a comment on Good News! 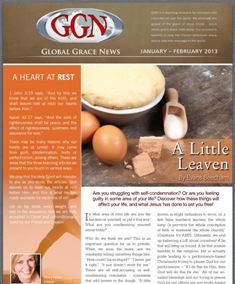 The Jan – Feb 2013 edition of Global Grace News – Newsletter was just released. In this edition my article “A Little Leaven” was published, as well as two articles by Steve McVey, “Forgive and Forget” and “Learning To Live With Imperfection”. To read the latest edition, click the newsletter icon to the left. Whenever we explore God’s Word, there are primarily two ways in which we study the Bible. One way is through sin conscious mind, (law-based approach) looking for “what to do”, “steps to take”, and “formulas to follow for success”. The law based approach, is where the sin conscious person seeks to find their value and acceptance by what they do for God. By doing the right things attempting to be worthy (finding their worth) of His favor and acceptance. They try to become, what God has already made them in Christ! That is an impossible task. John 5:39-40 MSG “You have your heads in your bibles constantly, because you think you’ll find eternal life (or the formula) there. But you miss the forest for the trees. These scriptures are all about me! And here I am, standing right before you, and you aren’t willing to receive from me the life you say you want. The second way is through a righteousness conscious, (grace-based approach) looking at how much God loves you, how righteous and innocent you are in Christ. How loved you are, and what God has already done for you. Only believe, He has done it all for you at the cross. How do you approach God’s Word? In this teaching, you will learn what determines your worth, and how approaching the bible through a righteousness conscious, will cause you to truly Reign in life! Posted on February 4, 2013 September 16, 2016 Author EvanCategories Grace Audio/Video MessagesLeave a comment on What Determines Your Worth?